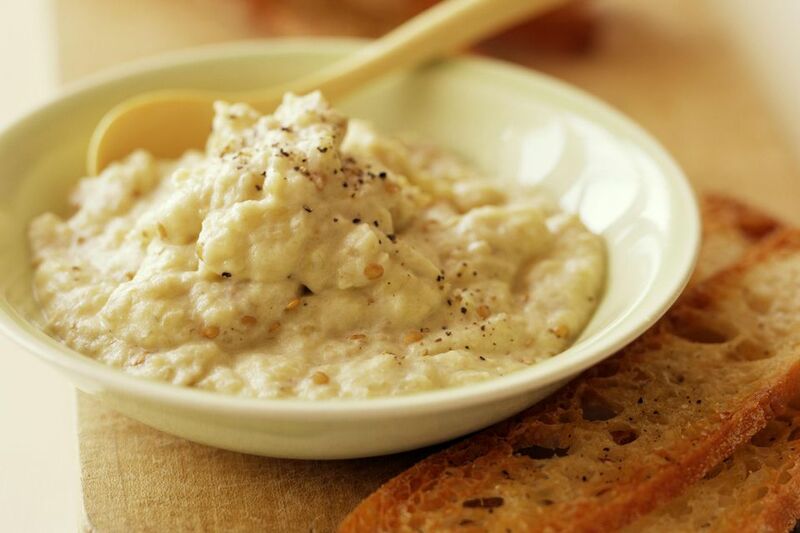 Baba ghannouj is a popular Middle Eastern dip made from eggplant and tahini. It has a smooth, creamy texture, and a slightly smoked taste. The bit of garlic adds another level of flavor and the lemon juice bring a fresh brightness to the dish. Baba ghannouj is traditionally served with pita bread (toasted or fresh); however, many people enjoy it as a chip dip with potato chips or tortilla chips. Although this recipe calls for baking the eggplant in the oven, the original cooking method for this age-old recipe was over an open flame, which you can emulate by using a charcoal grill. However, oven roasting will certainly do the job as the goal is to have the cooked eggplant be soft on the inside and crisp on the outside. Preheat the oven to 375 F. Use a fork to poke some holes in the eggplant skin. Place eggplant directly on the middle oven rack and roast for 30 minutes, or until the outside is crisp and the inside is soft. Allow it to cool for 20 minutes. Place the eggplant flesh in a medium bowl. Add the remaining ingredients except for the 1 tablespoon olive oil and mash together until the eggplant becomes paste-like. Alternatively, you can also use a food processor and pulse for about 2 minutes. Slowly add the olive oil and mix quickly and thoroughly to make sure it emulsifies along with the rest of the ingredients. If using a food processor, turn it on low as you pour the olive oil through the feed tube. Place the eggplant dip in a serving bowl and top with the garnish of lemon juice and olive oil. Add other garnishes according to taste. Baba ghannouj always has to have olive oil on top for garnish, but you can spice things up a bit by adding crushed red pepper or a dash of cumin. A sprinkling of chopped fresh parsley or cilantro is a nice way to add a bit of color as well as flavor. To get the most juice possible out of your lemons, first bring them to room temperature; then roll them on the counter back and forth while applying a little pressure. This will loosen the membranes and free up the juice. Tahini has a tendency to separate as it sits, so you will probably need to give it a good stir to combine the paste with the oil on top before using.